I met Ky Anderson at Greenpoint Open Studios, a weekend long event that gives artists a chance to open their studio doors and file in the public. The event ended at 6pm each day, but of course I tried to push my way in after closing time to get a look at some of the stunningly large and ethereal pieces she has painted. She further explained to me her online shop DUSK, which curates original series of printmakings by artists from all over. I wanted to pick her brain a little bit about her work, the shop, and being an artist right now in Greenpoint. Jess M: Hi Ky, thanks for speaking to us over here at Got a Girl Crush. 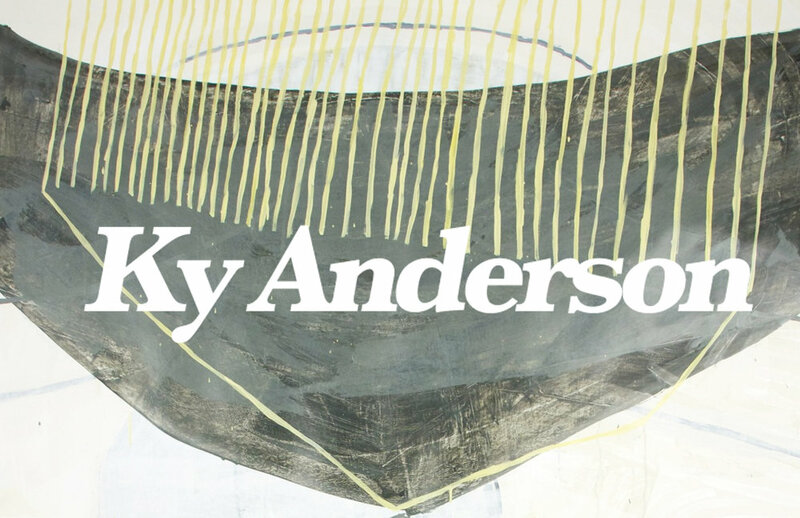 Can you kick this off with telling me a little about yourself and your work?Ky Anderson: Thanks so much for asking me. I’m a painter living and working in Greenpoint, Brooklyn. I also run a small gallery/press called DUSK editions that I run out of my studio in the Pencil Factory building. JM: What keeps you inspired, motivated and creating in the day-to-day? KA: I have an inner motivation that makes it difficult for me to take a break with my work. Sometimes it feels as if it’s an ongoing project with no possibility to ever finish it. New paintings are started before the others are finished and half way through a new idea another one starts. JM: How long have you been living and working in Greenpoint? How have you noticed the art scene change over time here? KA: I’ve been in living back and forth between Greenpoint and Williamsburg for almost 20 years, but consistently in Greenpoint for over 10. My studio has been all over and after being on a sublet cycle for many years I finally settled into the Pencil Factory Building a couple years ago. I’ve known people in the building for years and I’m happy to have finally settled into a little spot that works for me. For years Greenpoint was the sleepy neighborhood in the shadow of Williamsburg, but now Greenpoint has grown it’s own identity. We’ve got a nice thing going on right now, quality galleries, amazing artists and not all too overwhelming. (It’s still a bit sleepy, but that’s why I like it). JM: What are your favorite tunes for getting stuff done in the studio right now? KA: Music is a strange thing for me in my studio. If I’m just going through the motions on something, like stretching canvases like or cleaning, I can listen to music that’s new to me. But if I really want to paint I end up falling back on music I’ve been listening to for years. It’s annoying actually, if I had records in my studio they would be seriously skipping by now, I’ve kinda given into that this is just the way it works for me. My fallbacks are Kate Bush, Neil Young, Can, Glenn Gould, X, Nina Simone, The Cure, and a few more. If I’m not trying to paint then I listen to everything from classical to electronic. I recently discovered William Onyeabor, Bill Fay and Mock & Toof. JM: Indulgences that help you blast through the week? KA: I’m pretty simple, an afternoon coffee and treat will do it. I have a weakness for Ovenly (cafe) down the street from my studio. JM: What inspired you to start DUSK? How do you feel DUSK has affected your thinking as an artist and your own work? KA: DUSK began simply because I love other artist’s work just as much as I love making art. I wanted to get my hands into it even deeper. As artists we constantly visit one another’s studios, in these studio visits (like Greenpoint Open Studios) the idea of DUSK started to develop. I found myself putting together small series of work that the artists had overlooked and picking out, what I thought, were the gems in their studio. I decided to work within the formats of series and editions. I work closely with the artists as they are making their work for DUSK. I often visit their studio and look through everything and then give them a loose assignment. The work that has come out of it has been great, often better than I could imagine. It’s been a really fun and rewarding process. I find working with everyone really inspiring. There’s a constant great conversation going on. JM: Can you fill me a little more about connecting & working with the female artists you have in the shop? I noticed a few of these women are from Kansas City, can you tell me more about what’s going on in the art scene there? KA: I was born, raised and schooled in Kansas City. I graduated from The Kansas City Art Institute in 1995 and still have strong ties to the people and art community that thrives there. Kansas City has a deep rooted art community. Many artists move there to attend the art school and stay, so it’s created a multi generational community filled with people from all over. More and more galleries and art programs are starting up all the time, and a few years ago there was a giant, beautiful expansion to the Nelson Atkins Museum. Even though I don’t live there anymore, I still feel strong ties to the community of artists and I feel very fortunate to be connected. One of the artists that I chose for DUSK is Debra Smith. She is an artist living and working in Kansas City. I like to say that she paints with fabric. Her gestural and graphic work is pieced and sewn together with vintage and found silk. She has perfect craftsmanship in her work, something that I greatly admire and value in art work. I’ve also worked with Yifat Gat, an Israeli artist living in the south of France, and Vicki Sher from Brooklyn. Both painters who make really solid work. I’ve got some great projects in the works from artists from all over. I’m pretty excited about it all. JM: I really love the documentation you have of other’s work you personally own shown through your tumblr can you highlight something that has a rad story behind it? KA: I started my art collection blog with the idea to document and appreciate the artwork I live with and to encourage art collecting. Not all art is expensive and I like to tell stories about how the work came into my hands to show that you don’t have to have a lot of money to grow a collection. And that sometimes a piece of work by your favorite kid or something you found at a thrift store should be included in your collection. It does help that I’m able to trade work with some of my favorite artists, but I also trade with non-artists for work. I’m sentimental about the work I have, most of it is from artists that I know. But I also feel really strongly about work of people I don’t know, when I see a piece of art that I love I feel a gut desire to grab it and run out the door. But of course I can’t have 99% of the work I want, so I do a lot of trading. Several years ago, pre social media, Yifat Gat wrote me an email. She had just started painting again after a long break. She found my website and was happy to found someone that had a similar eye. After really falling for one another’s work we traded. I got one of my favorite pieces I own. We are still friends, she has come to NY several times, I’ve released her work through DUSK and we are working on a trip for me to come and work with her and show my work in the south of France, where she lives. JM: Whats next for you? Any upcoming shows or plans? KA: I have a show that just came down at Proto Gallery in Hoboken, NJ. It was a group show with two of my favorite artists Meg Lipke and (DUSK alumna) Vicki Sher. The show was titled PAPER GIANTS and consisted of large works on paper, all 6 by 5 feet. We started on this project together about a year ago. Throughout the year we did constant studio visits and sent photos back and forth, so in the end all the work has each other in mind. We also were interested in seeing our work together without the distractions of different sizes and materials. With the consistency of size and material you’re able to view and compare the work in a pure form. We are continuing to make the work and hope to tour the show with new pieces. Here is the catalog. I’m also curating a show in NY (summer 2015) with the artists I’ve worked with through DUSK. I’ll be showing a combination of work I’ve released though DUSK mixed with current work by the artists. I’ve got several themes swimming around in my head right now as I finalize the concepts. Also a few more DUSK projects that are in development right now, one I’m excited about is collaboration on a double edition by Jason Grabowski with Novella Gallery. JM: Do you have any advise to fellow female artists in growing into the art scene here in Greenpoint? KA: Come visit me, I love studio visits.